When Hester White is hit by a horse and carriage on the streets of London in 1831, she is brought into the home of the Brock siblings, Calder and Rebekah. Calder, a surgeon, entreats his older sister to become a teacher to Hester, whom he mistakenly believes to be an uneducated member of the poor working class, given the area of town where he came across her. In truth, Hester is the orphaned daughter of a pastor, who was taken in by her father's former gardener and his wife. Fearful of being sent away to the Society for the Suppression of Mendicity, she plays along with the scheme, adopting the mannerisms and speech of her friend Annie. The more time she spends with Rebekah Brock, the more she feels a connection to the woman, but the connection is of a nature that confuses and frightens Hester, and for much of the early part of the book, Hester is uncertain of whether or nor she can be trusted. Alongside this Victorian love story, there is also a mystery. People have been disappearing all over town, and handbills litter the streets asking for information on the whereabouts of loved ones. Rebekah and Hester both have connections to missing people, Rebekah having lost contact with two previous ladies' maids under suspicious circumstances, and Hester having made a commitment to meet a cousin to seek employment, finds it strange that said cousin has not turned up in the three weeks since he was supposed to arrive. 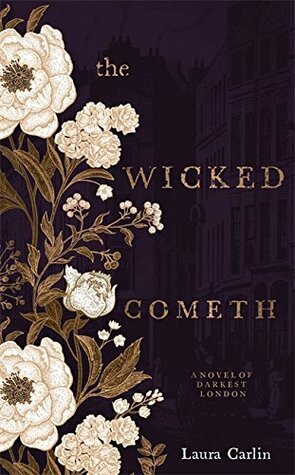 The Wicked Cometh is a modern attempt at the Victorian sensation novel. It has elements of Conan Doyle and Du Maurier, as well as paying homage to Dickens and Wilkie Collins. At times the language of the book can tend to be a little florid, but the story itself is compelling enough to make up for this in my opinion. While it has been compared to Tipping the Velvet and The Crimson Petal and the White, I would argue that this piece is a lot more plot driven than at least the second of those as it is not a novel that functions on quite so intellectual a level, instead choosing to draw the reader along by emotion. One thing that did strike me as a little strange was the choice to tell a historical story in the present tense. This is an unusual technique and I struggle to think of other examples where it has taken place. 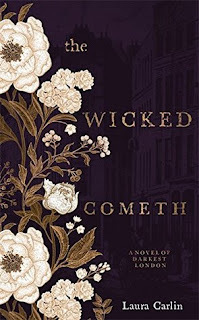 However the author, Laura Carlin, has done an excellent job not only of evoking Victorian London, but of building a sense of atmosphere that heightens the development of the mystery at the centre of the plot. Perhaps a little too much time was spent early on in the romance aspect of the novel (for little pay off, may I add), and this meant that the solution to the mystery did seem to come all at once in a late chapter, explained by a very minor character. I did very much enjoy this book, despite its flaws and I would certainly read another book by Carlin were she to write about this era again. Highlights of the book for me included the link to real history, such as the Anatomy Act of 1832 and the Mendicity Society, the well crafted setting, and the development of two compelling characters in Hester and Rebekah. Thank you to the publisher for providing a copy of the book in return for this review.